At the entrance to Moshav Givat Yishayahu sits a pinkish building. It is a quaint combination of farmhouse, restaurant, art gallery, and olive press. Located among the vineyards and olive groves of the Adulam vineyards, in the Samson region, it is the area where David and Goliath battled. In fact, the name Kela David means David's sling. One of the small boutique wineries that dot the region, Kela David produces roughly 10,000 bottles of white wine a year. Connoisseurs will no doubt, consider the wine to be unspectacular, but the restaurant, which offers a varied rural menu, and ambiance, is worth a visit. The restaurant also serves Tishbi's red wines. Everything from the rustic breads, which are made in a special taboon oven, to the deserts, is made on site. Some of enticing appetizers include: Stuffed Portobello mushrooms in a sour cream sauce, Antipasti, onion and chicken quiche, and fresh pineapple stuffed with chicken. The rest of the menu features; soups, salads, pasta, taboon-baked goods and of course meat courses. In the evenings, it is best to book a reservation and despite the fact that Kela David it is a bit remote, it is also a popular spot for business lunches. During the wine harvest, in August and in late November, during the olive harvest there are special events on site, so it is best to call ahead to inquire about the events. Dr. Amos Barzilai and Smadar Kaplinski have created a charming place. You may wish to combine lunch or dinner with a visit to the Scroll of Fire or Beit Jamal , just a few of the attractions in the area. 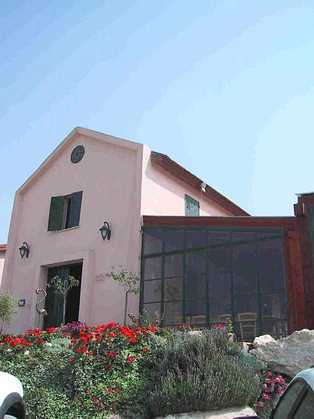 Some of the other wineries in the area (some in the nearby Judean Hills area) include Dumaine du Castel, Tzora Vineyards, Soreq, Latrun and Nachshon. This area of the country is being promoted domestically as Wine's Way, or Derech Ha'yayin. Not all of the wineries are open to the public, but it is certainly possible to plan a day of winery visits. Directions: Kela David is located off Route #38 (the Beit Shemesh/Kiryat Gat road), at the entrance to Moshav Givat Yishayahu. Hours: Daily from 10:00 AM, reservations required from 6:00 PM.